It's campus visit season, and TBTAM is off with her daughter visiting college campuses. That got me reading, and reading made me think, and thinking made me write. I basically half-assed my way through my one campus visit. My Dad had some business on a weekend during the summer about half-way to the school, so we went to his business, and then went to my campus. The one thing I remember is my Dad walking into some restricted area, and my being very worried that someone would come and we'd get in some huge trouble. My Dad kept telling me not to worry, but I kept fretting. But, of course, it being a weekend during the summer, there was NO ONE around campus, nothing open. The campus was beautiful, but totally unlike itself during the academic year when I would be there. Okay, so I didn't know better. My Dad was doing his best, but his own college experience was a while earlier, and a very different experience from my own. Since about half of NWU students are first generation college students, I'm betting their families could use some help putting together the college visit. So here goes. The US News and World Report rankings skew in certain ways, and so schools game the rankings if they can. One way to game the rankings is to decrease the percentage of applicants a school admits. You do this by encouraging a LOT of students to apply, knowing they really stand no chance of getting in (because you aren't increasing enrollments). If you want to accept 100 students (hoping for a class of 80, perhaps), and you could get 500 students to apply, then your "selectivity" rating looks great, and you get all those application fees so gaming doesn't cost the school anything. It does cost the students a lot, though, and more than money. Most schools are competing for students, so when you go for your visit, think about how they're competing, and what looks good to your 18 year old. And think about the things your 18 year old might not be thinking about yet. New dormitories and recreation centers are big these days. Students love the idea of new dorms, semi-private rooms, free internet access. And being comfortable in a living space is a good thing, indeed. But a campus that's putting a load of money into new dorms isn't putting it somewhere else, right? Before you visit, get a copy of the catalog or look at it on-line. Think about the kinds of things your student is interested in, and the majors available, the size of the school, the location, general education, and so forth. College catalogs should be treated like fantasy dream books; they've got all these incredibly interesting classes, and students get to dream about taking them. But also keep in mind your local community college, because they offer great opportunities for a lot of students. So, what to do on your visit? First, try to visit on a weekday during the academic term, and call ahead to see if you can arrange for your student to sit in on an introductory level class in some field or other. Anthropology is a good choice, or geology, or sociology. Your student will get a sense of how big introductory classes are. At some schools, the lecture hall with have 200 or more students, at others 20. After a few campus visits, your student will get a sense of what s/he's looking for. While your student is observing a class, go to the library, walk up to the reference desk, and ask for some help in finding some information, something you're interested in but don't know the answer to. When the librarian helps you find it, or explains how to use the system, then you'll know your student will get help at the library when s/he needs it. And yes, s/he'll need it at some point! (If it's a bigger school, make sure to go to the undergrad library.) Does the library look like it's in decent shape? Are there interesting displays? Study areas? New book displays? Get a tour of campus. Notice how the tour guide is an especially good looking student? When I ask my first year students about why they chose NWU, at least one a year says the tour guide was really good looking. I kid you not. During your tour, ask the tour guide about general education. If s/he talks about jumping hoops or "getting those classes out of the way," then general education isn't working well for that student. If, on the other hand, s/he talks about a system that seems connected and meaningful, it's working. General education is about 1/3 of a student's typical college work in the US; you want it to be meaningful for your student. When you previewed the catalog, you should get a sense of how the college thinks general education should work; if it looks like a mish mash, it probably is. Making general education really meaningful is one of the most difficult aspects of creating a college curriculum. Ask the tour guide about what classes s/he's taking and who the teachers are, and about office hours. Schools choose their tour guides from the best students available, and if this student doesn't this student doesn't know teachers' names, or talk about their office hours, or remember what classes s/he taking, know teachers' names, or talk about their office hours, there's a problem. If s/he talks about this or that great teacher or class, then something good is probably happening. Yes, your student will be embarrassed as all get out while you ask all these questions, which is all the more reason to send them off alone to observe a class. I'm sometimes asked (often at the last minute) to meet with potential students and their parents for a campus visit. I sort of blogged about this a while back, and a "mommy blogger" criticized me in her blog for not being enthusiastic enough about talking with parents because, as she noted, she was paying my salary. Well, yes, and my taxes are putting her kid through school in part. Here's the thing, I'm fine with talking to potential students and their parents (the word "fine" was what she took exception to before). BUT, it takes time, and it takes away from all my other responsibilities. So if you want to talk to a prof, make sure your student has some questions to talk about, maybe some questions about the shape of the major or internship/research opportunities. This is the time for you to back off and encourage your student to make choices, speak, and be an adult. And yes, your student will probably be shy about talking to a professor. That's okay; I'm shy about talking to new students, too. Please don't ask me what books your student should read because a) I don't know what your student has already read, and b) I'm likely to think about novels in really non-canonical terms, and c) the answer is always Shakespeare! duh! The good news is that most college students graduate from their college, and most think their college was the best choice for them, often after some difficult struggles. I loved my undergrad university, and only later realized that I would have done far better at a school with smaller classes, such as the community college, for my first two years. But I also had opportunities at my undergrad school that I wouldn't have had at probably any other place in my state. And I was smart enough to actually take advantage of a couple of those opportunities! Edit to add: I screwed up the date the first time I posted this and left off the 3 so that it came out 4/2 instead of 4/23. And then I couldn't figure out where the post had gone missing to, and figured it was eaten by the ether. I've become sort of involved in this English club, and it's my turn to plan an activity. From what I've seen, the idea is to plan an activity that will give people a lot of chance to practice speaking English with each other about some more or less focused topic. We've done some mixer type activities, including talking to a partner for a few minutes and then introducing them to the group, and some activities that involve doing a short reading and then discussing it first in small groups and then as a whole. I could really use some ideas! Does anyone have a new mixer idea? Or a short reading for discussion type idea? Or just a really good "discuss this" idea. I've been pondering this, and it's taken me a while to be able to articulate it. I'm still pondering. A while back, Jeff informed out department that he's newly diagnosed with depression and is under a doctor's care for it. A short while later, Jeff asked me if I couldn't find someone else to take his spot in the committee I chaired. I emailed back that Jack could ask around, but that I didn't think anyone else was looking for more committee work, since we're all pretty overloaded. I declined to undertake to find a new committee member. And later still, a colleague mentioned that he'd taken over a different task for Jeff for the term. I expressed my, well, irritation. And the colleague explained that as we all knew, Jack's suffering from depression, and ill, and the colleague would have helped another colleague with any other illness, right? And I had to admit, that s/he made perfect sense. So here's the thing. I've helped do things when colleagues have been ill. I've filled in teaching a class for a colleague who took parental leave for a while. I try to be a decent person. I do recognize, logically, that depression is an illness. BUT, and here's the problem, I reacted emotionally as if it's NOT an illness, but some sort of failing or laziness. Why is that? Why do I react negatively? Is it because "depression" has become so overused that I don't quite believe it on some level? I know a number of my colleagues are on medication and/or seeing therapists for depression, etc. Does my response come from thinking that if everyone who's depressed needs other people to cover his/her work in some way, that some of us will be slammed even more than we are now? How is depression different from other chronic health problems, if at all? When I think back, one of the things I'm most ashamed of in my life is treating a mentally ill friend with great impatience. I couldn't wrap my head around her difficulty, and was harsh. And I'm still bothered by that. Most things in my life, I don't greatly regret, but that one time, that I regret. But even though my reaction to Jeff isn't as big, it's the same basic response. And I don't like that in me at all. On the way back from my outing today, I ran into someone else who lives in the apartments here because hir spouse teaches Spanish here. We started in English, but switched to Spanish. And I have to say, while my Spanish is FAR from perfect, it was really lovely to be able to basically express myself like a minimally intelligent person. One of my friends lent me a book on learning kanji, and it's helping, but I'm basically an illiterate idiot, half-a$$ing my way around, and it's frustrating sometimes (and was frustrating today). I need to find a way to get a South American teaching abroad position (well, specifically where they speak Spanish)! My dad was a pretty good guy, but he didn't much like rock music, and he wasn't shy about saying so. I can't hear anything else, just bass. Grrr. It struck me a long time ago that playing music loud enough to share with the neighbors is a lot about power. It's forcing people to listen to you when maybe they wouldn't normally. And forcing people to deal with you on your terms. When I lived in the dorms at college, the guys in the room next door played two songs a lot. One I don't remember the tune to, but the basic story had to do with a man getting in the backseat of a car with a woman, and taking off his tie really slowly, and then putting it around her neck very fast. And putting her in the trunk. But it's okay, the song went, because, "she is dead, she is dead, she is dead." I found that disturbing. It's hard to go bang on the door of the drunk guys next door when they're playing a song about killing a woman, you know? Their other favorite was something along the lines of "Your love is like a nuclear waste; They've stamped contaminated across your face; Your love is like a nuclear waste." They were real winners. I'm so glad I don't live in dorms any more! I was working on getting my mentors registered for next fall's writing class via email a bit this afternoon, so I had several things open, which meant that the email program label on the tabs for outgoing messages I was trying to send was "Untitled mess." Somehow, that label just seemed to fit my mood. I'm in a sort of foul mood, thoughts running together. You know how, when you hear the guy on the bus who explains that Jerry Lewis and George Bush met at his house last night to plan the small pox attack on dalmations, you wonder how he thinks he's being really logical but he's not? I'm worried you'll think that of me. I was reading a job blog I read sometimes, one of those blogs people write about their work. I find job blogs fairly interesting, though really, none can beat medievalist blogs. (I just don't think that's fair, but there you are; medievalists also have more fun at their conference.) Anyway, this job blog is written by JB, a young woman who has a pretty high powered job. JB is also a pretty strict Christian, and not at all reticent about talking about her religion on her blog. One of the things she's blogged about recently is that she wants to tell her co-workers about her beliefs, including that women shouldn't work outside the home and should be subservient to their husbands within the home. But she's worried that they won't treat her like an equal if she tells them that, and they may mock her for inconsistency. If I knew JB, I'd probably gently suggest some rethinking. But one doesn't really do that in the comments of blogs. I read the blog because JB is interesting, and thoughtful, and has developed in some interesting ways through the course of writing the blog, which one can see if one goes back in the archives. And that's pretty cool. I admire her openness about some things, though she scares the dickens out of me about other things. I've seen a couple blogs talking about Barack Obama's comments about some Americans being "bitter" or "clinging to guns or religion" (see "Obama rues 'bitter' voter remark"). One of the bloggers is all pissy because Obama dared to criticize people who believe in religion and own guns. Another is doing headstands trying to explain that Obama wasn't really criticizing religion. And just the other week, folks were criticizing Obama for going to church because they didn't like the sermons. I'm not convinced by Obama. He's way too conservative for my liking, and from what I've read, doesn't strongly support choice about abortion, and isn't strong enough on glbt rights. But I could change my mind if he actually came out and said that people who believe in religion need to exercise better critical thinking skills. Of course, then he'd get my vote, and maybe three others, while a lot of people would be all busy being offended. I've had some serious conflict with my Mom about religion from the time I first told her I wasn't going to church because I'm an athiest. It wasn't easy while I was a teenager under her roof. Like JB, my Mom has her own special versions of religious rules, which are pretty unique. But she finds them comforting, so I've learned to keep my mouth closed. And who did they turn to to choose the hymns? Because, apparently, only one of us had every talked to my Dad about his favorites. And I did my part at the service. And every bit of it was false and painful. But I did it because it was important to my Mom, and her needs were more important, her pain more deep and abiding. I look around, and I see people who fervently believe that there's a big guy in the sky who is all benevolent, all knowing, all powerful, and worth worshipping, and they believe this in the face of tragedy and disease, in spite of a total lack of evidence, and in spite of other people's equally fervent beliefs in totally contradictory things/beings. It's a mess. Librarians: Visit Them, Love Them, Learn! My students are working on a research paper. I know they've had research paper assignments before, because the faculty who teach the first two years of English courses tell me they all give research paper assignments. We started the assignment by brainstorming about possible research questions. That went well. The students came up with interesting potential questions, then I gave them feedback, and they refined, and I gave them more feedback. And their first step in the research process was to start by looking up some broad information, preferably in the library. I emphasized how helpful librarians are. And then I mentioned again (and again) that librarians are super helpful and know how to find all sorts of information. This week I've been holding office hours as they prepare their first draft. Some students come in and they've clealy gotten a good start, found some resources, started organizing. Those are the students I don't worry about. The students I worry about come in and sit down, and then look at me. I ask them a starter question, how's your paper coming along? What can I help you with today? We've worked on some bubble maps and outlining, so maybe they pull out a bubble map, and we look at it. And I ask them how the research is going; what have they found out. Then they tell me they've looked on the web (ahh, source of great potential, both good and rotten), and can't find anything. Or they pull out something they found on the web, and we talk a little about it, but it doesn't really apply. So I ask the magic questions: Have you been to the library? Have you talked to a librarian? If I could convince all college students (heck, all people in general) of one thing, it would be that you can usually get really good help finding good information about things if you visit the local library and talk to a librarian. Best of all, they can help you figure out really solid, useful sources of information, so that you don't get confused by stuff that's too technical or so far off the wall that it's not helpful. I love librarians. I only wish my students would, too. I wish they knew how happy I am to see their names. ps. In other news, the book I lost on the bullet train has been sent back to our library! So, for about $9, I was able to pay the postage fees, and they have the book back. Now I don't have to worry about guys in dark black suits knocking on my door in the middle of the night to deport me! One of the faculty members is headed to one of the great European capitals in early summer for a couple weeks to teach a course, and the other folks had spent a good deal of time there, and so they reminisced, as people only can about this specific capital, talking about the neighborhoods where they'd lived at various times, favorite spots, restaurants, and so forth. I nodded and made appropriate oohs and aahs. I've never been there. And then another talked about having lived in an amazing world capital, and they talked earnestly about things there, and their experiences there. And then there was discussion of growing up in the City like No Other (to borrow Jo(e)'s term, I think), and summers in the hither and yon, studies abroad, honeymoon trips here and there. I did a lot of nodding and oohing and aahing, and enjoyed hearing about all their adventures. But I also felt quite the rube, or yokel, or something. The thing is, if you grow up really in the country, you have a certain cachet; you grew up doing this, or that, running here and there, getting into certain kinds of troubles or not. And if you grew up in the City like No Other, you have another kind of cachet. If you grew up in the suburbs, as I did, you don't have much cachet. Parents choose to raise their kids in the suburbs because it seems safe and easier, and so on. But if you grew up where and when I did, you could ride your bike here and there, but not get into much trouble. But to go anywhere interesting, you needed to drive. I need a word to express the lack of ... of having grown up in the suburbs. Yeah, and I also couldn't read the menu at lunch, because while it was written in two languages, neither was a language I've got. Happily, my colleagues translated what I needed for me, and were (as I would expect from them) pleasant and wonderful. Still, I'm such a .... I need a word! After lunch, I split from the others (who were heading home to relax) to take myself back to one of the places I visited when I first got here, the Ginkakuji (Silver Pavillion) and the Philosopher's Walk (because I'm still trying to pack in all sorts of sight-seeing). The Ginkakuji was the home of a shogun, and then turned into a temple, with an incredible garden; the philosopher's walk is a walk along a (now paved) stream starting nearby and going south a couple kilometers. The sakura (cherry blossoms) are almost done, but the Philosopher's Walk is one of the most famous viewing areas, full of blossoms still today, and equally full of people viewing the blossoms. I had a really nice walk, and revisited a small shrine with mice guardian figures (I'm not sure of the name, but I think of it as the Mouse Shrine) a block or so off the Philosopher's Walk. There's a small building thing with traditional sake barrels; my basic understanding is that the mice are guarding them, and through them the rice that sake's made from. The shrine is very small, and doesn't have an entrance fee, but I did buy a couple of the wooden pieces you're supposed to write on to leave at the shrine. The pieces have pictures of mice on them; I think in this case the idea is that the mice will take your message (a prayer or entreaty) to the gods (you can see them behind the guardian mouse in the picture). There are also a few fox, monkey, and bird guardians around. Afterwards, I walked to the end of the Philosopher's Walk, and then turned back down towards the Kamagawa, the main river that runs north and south through the city, which I use as my navigational landmark ( along with the eastern mountains). As I was walking, I overheard some folks with American accents complaining about all the tourists. It's sort of weird, isn't it, tourists complaining about tourists? From what I overheard, they sounded like they thought they were missing the authentic Japanese experience. And I was thinking, "But Dude! It's sakura season, walking along a stream with a ton of cherry blossoms and loads of other people is about as authentic an experience as you're going to get." But I kept my mouth shut and took some pictures of the blossoms. As I walked, I kept thinking about how much more familiar the city felt to me now than it did just a few short weeks ago, and I found my way back to my train line without really being concerned (and since I get lost easily, I spend a lot of time being concerned about being lost, usually). I got an email yesterday which reminded me that I need to start thinking a bit about my fall classes. All of them. Okay, writing is pretty much going where it usually goes, and I don't actually have to preplan that right now. But I need to start preparing the others, and ordering some stuff, so I thought I'd share some of the fun. If you're a grad student, or even if you're not, feel free to share the fun! I'm also thinking about which early modern texts to teach. So far, I'm thinking of focusing on representations of Black, Islamic, and Jewish Others. And I'm planning to teach Oroonoko (because it's a cool text, though late for me, and not drama). I'd really love some other suggestions, especially those that might take us into interesting directions. Drama is the main focus, but some non-dramatic texts wouldn't hurt too much. Second, for the Chaucer and medieval types! Once again, I get the privilege of teaching Chaucer, because at this point, it's me or no Chaucer. And though I'm not a real Chaucerian, I love teaching the stuff. The class is set at the junior level, which is totally new for here. So I want to totally avoid giving students an assignment to write a "research" paper for the class. Instead, I'd like to see the junior level class as building skills for writing a research paper, specifically skills in reading critical essays well and in asking good research questions. In order to work on developing reading skills, I'd like to choose two or three really top notch recent critical essays on some Chaucer piece that I can use to get the class to read, discuss, and work through. (We'll also be using Graff and Birkenstein's They Say / I Say to help with thinking about such things, and then they'll find another critical essay and write a response to it.) So here's your chance: suggest a really good critical essay on something suitable for a Chaucer class! The best suggestion in each category will win something fun (and easy to mail) from Japan! Category 3: Recently published critical essay appropriate for a Chaucer class. Once upon a time, a middle-aged male dean went to the women's equity organization on a college campus to give a talk about campus service and administration. The dean was a man of good will, and interested in helping women on campus. The talk was attended by a variety of people, men and women, students, staff, and faculty. One of the women asked the dean how he'd gotten started moving into administration, and he said that he'd been on the back porch of an administrator friend drinking bourbon with the guys, and the administrator had suggested he might be interested in being a deanling. And so he'd been appointed. The dean, of course, meant well, and he hadn't (I'm sure) thought at all about how his ability to be part of the back porch power group contributed to his movement up the ladder, and at the same time prevented women from having those opportunities. And no one said anything to the dean or at the meeting, though afterwards a small group of women faculty who'd been there discussed the comment. Women try, with limited success so far, to fight the system. In one case, a fair bit of discussion led to the administration actually adopting a policy of announcing a position and allowing applications, rather than just announcing that an interim or deanling had been chosen. And one of those positions has gone to a woman. So there's some success, but it's limited, despite some pretty politically savvy women working hard. One of the back porch power groups is pretty visible from my office. I first realized that it was a power group when one of the members (let's call him Joe Doe) basically said, "the guys were discussing [issue X] on the porch last week over cigars*, and we decided we should do [Y]." And Y had been done without further campus discussion. When I asked Joe why they thought they could decide an issue on the porch in an all male group, he looked astonished, and a little hurt. They (he) hadn't thought about it as an issue; there were a lot of people there and they'd just decided. Now, I think Joe is well-meaning. I don't think he considers himself a sexist, nor does he want to be a sexist. He's hurt that I think the porch group is sexist, that I don't trust them when he thinks I should (in a sort of paternalistic way). Joe has pretty much stopped mentioning the porch group around me. He knows it's a problem, but it's an important part of his access to power, his social scene, and his privilege, and he doesn't want to question it or give it up. Why, Joe says, shouldn't he socialize with the people he wants to hang out with? I understand not wanting to give up privilege. But, if I were a member of an all white group that explicitly didn't want any person of color around, and someone called me on it and told me we were being racists, I hope to hell I would take a good long look at myself and say, "Self, you're being racist. Stop now, tell the group so, and either change the group or leave." The socializing thing may be harder for me to answer. I'm a member of a sports team made up (usually) of female members of my department. (I say usually because a high school male is participating for me while I'm gone, and another male has participated in the past, and a couple men have subbed when someone else was ill or something.) I'm a member of a casual reading group that's all female, and mostly faculty members from across campus. In each of those groups, we do discuss campus issues, and in the reading group, we've encouraged people to run for various faculty committee jobs and offered to nominate each other. So is there a difference other than the fact that my groups don't include anyone with real power on campus? It's good for me to be away from campus for a bit, in part because it gives me a chance to think about things without being confronted with them or having to act on them immediately. I need to work out a couple things. First, I need to not let the back porch thing irritated me as much as it has, because my being irritated doesn't change anything and just makes me unhappy. Second, I need to figure out what I can work to change, and if it's worth doing that work. *The back porch group sounds like a return to the 50s, in a sort of straight white male fantasy of 50s academia where they can hang out, smoke cigars and drink. I'm so disappointed at myself! I lost a book, a library book. I went to 'fess up today, and they're going to try to call the train line to see if it was turned into the lost and found. The librarians were nice about it, but it's still embarrassing to have to tell three people that you've lost a book, and explain where, on up the line of authority. I filled out a form, and if it was turned in, I'll get to pay to get it shipped back. And if not, I'll pay to replace it, of course. In other news, I wasn't much enjoying The Tale of Genji anyway. It felt like a row of little sexist episodes of a male (that would be Genji) seducing one woman after another. There was a lot of telling how amazingly wonderful Genji was, but I wasn't much convinced, I'm afraid. I'm sure I'm missing something, but I think that's also part of the narrative style. It was cool that it happened in areas of the old capitol where I've been, but other than that, it didn't do much for me. Still, I'm disappointed in myself for not being more careful about it! A student in my class asks me to help him/her with some piece of writing, usually an application for study abroad, a statement of purpose for grad school or an internship, it could be almost anything. So I suggest that the student come to my office hours, that happen to begin an hour and a half (or so) before our class (the one s/he's taking from me). And inevitably, the student shows up 15 minutes before class starts, paper in hand. I just don't quite understand what the student expects in this situation. My practice is to read the paper with the student there, to give him/her some feedback, and explain things as I go. But how am I supposed to do that in 10 minutes (because I actually have to walk to class)? This happened here the other day. It's happened innumerable times in the States. And I still don't get it. These are students who've gone over classwork with me, so they know that it takes a while to go over a paper. And these are intelligent folks, but I just don't know what to think. Today I went to a hanami (or is it an o-hanami?) at our local park. Hanami, I'm told, means cherry blossom viewing. You have to love a culture that has a special word for going out to look at spring blossoms, don't you? Take a good look at this picture. Yes, good, there are trees blossoming. Those are cherry trees, and the blossoms are called sakura. Welcome to the local park. Now look at the people. What do you notice? Right, there are people in the foreground playing a sort of casual volleyball, and all around there are people either sitting on tarps (blue tarps are de rigueur; I wonder if FEMA has the same supplier?) or at a table with food. Notice that no one is actually looking at the blossoms? It turns out that if you take a good look at the blossoms when you get there, they don't do a whole lot in the course of a quiet afternoon. So everyone takes in the blossom scene as they arrive, and then gets down to picnicking. Because really, hanami is just a fancy word for "thank the kami it's spring; let's go outside, chat, relax, and eat!" I have a theory about this. Japanese folks are work notoriously long hours. It's not enough to get there at 8am and leave at 6pm. Nope, a lot of people work until way later. And then they go in on Saturdays, too. As long as the boss is there, employees tend to be there. So, way back in the 700s, I think, some employees-- tired of winter and long days at the office--got together and decided they wanted to go on a picnic. But they needed a reason to tell the boss because they were leaving Saturday at 5pm instead of at 8pm. So they told the boss they were going to go to a hanami, that most Japanese of all pasttimes, and invited the boss to come along. The boss, being equally tired of winter and long hours, accepted, and the rest is hanami history! I learned at our hanami that companies hire new employees to start in early April, that schools all start in early April, and that people retire in April. One of the staff folks told me that often the first company event someone goes to is a hanami, and the last company event is hanami, so hanami marks big transition points around here. I may sound cynical, but I know a good picnic when I eat at one, and our picnic was great! Of course, I'm going out again today, because hanami season is short, and after that a picnic is just a picnic. And need I remind you to thank the kami it's spring? These are the women's shorts. Now, you probably know that bikers tend not to wear anything under the shorts, right? So why the heck would we want to look like we're wearing something over the shorts? 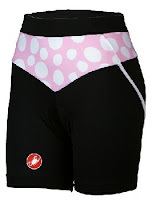 And pink with polka dots? I'd bike nekkid before I'd wear these. Yes, that's a target, I think. A while back, there was a picture circulating on the internet of a men's biking team in (I think) white shorts that were just a tad revealing, which makes me think that if someone just gives these designers a hint, they'll make the target shorts in white. And you thought my endless bird pictures were bad! My students are working on research questions for their papers now, and I've noticed a couple interesting things. One of my students is considering either a question about drug use in the US, or a question about recreational opportunities at the school where she'll be studying. I'm rather proud of myself that I didn't just blurt out that she could write a paper about the intersection of those two issues. Another student is worried about crime near where she'll be studying. I think she sort of imagines the US as a place where drug dealers will try to force her to use whatever drugs and everyone carries a gun. I assured her that drug dealers are out to make a profit, and probably not giving their product away for free, and that I've never seen a gun used except at a firing range. A third is interested in the problem of obesity in the US. I'm thinking that their impression of the US involves a lot of obese people shooting up and shooting each other. Usually, when I work on research questions with US students, about a quarter end up with questions related to health, especially alcoholism and diabetes. Here, the only health related question is about US obesity. Other than the relative dearth of health related quesitons, the questions range pretty widely and should make for really interesting papers. Today was Host University's opening ceremony for the semester. I'm learning that such ceremonies are usual here in Japan. New students come to campus all dressed in dark suits, with parents (also pretty much in dark suits), to attend a welcoming ceremony. My undergrad university basically had a "drop your kid off at the dorm" day, and that was that. There were a few days of dorm-based orientation, and then classes started. That's how my home university does it, too. I taught for a while at Cornfield College, an private SLAC in the midwest, and there we had a matriculation day. New students moved into the dorms in the morning. In the early afternoon (under the hot blazing sun in our regalia), we had a shortish ceremony where mostly the president welcomed new students, thanked the parents for preparing them, and invited everyone to the campus picnic. And then there was a big campus picnic, food for all. Faculty who were teaching the first year special program class ate with their class, if I recall. Then the parents went home, the faculty went to drink on someone's porch, and the students disappeared into the dormitories. Host University basically runs two school calendars, one a traditional Japanese calendar starting in early April with a big break from January to April, and the second a western style calendar (mostly for international students) starting in August and with the big break from May to August. Some Japanese students, mostly the more advanced, join the western style calendar and take classes with international students as they prepare to go study abroad. That means they probably totally miss a break somewhere along the line. So while campus has seemed reasonably populated, it will be fully populated starting at the end of this week. But the campus has a different feel than most campuses I've been at, mostly because students don't live on campus. There are a couple of off-campus housing facilities for mostly international students (some of whom also live with host families), but Japanese students by and large live off campus. Unlike in US college towns I know, students don't seem to live in areas close to campus, nor, they tell me, do they tend to share apartments. (Though apartments here tend to be pretty darned small, so I can see not wanting to share.) Lots of students commute a couple hours a day, and live at home. Most also work (as do most of my students in the US). It's exciting to think of all the new students across the country starting college now. Good luck, new students! Study hard, learn lots, and do better things than my generation has!